School officials said Eagle Rock Middle School has been using geothermal energy for almost two years, and there has been no change in the quality of the heating and cooling. But officials said the costs are much lower than a conventional heating and cooling system. "We are (pumping) water that's already 55 degrees, so we have a lot less differential to heat or cool the building," said Director of Operations Kevin Klingler. The Pagosa Springs Community Development Corporation (CDC) is pleased to announce that Jerry Smith of Pagosa Verde, LLC will join our monthly public meeting, Monday, April 1st at 5:30pm at the Quality Resort to present his proposal for a geothermal power plant in Pagosa Springs. The Town of Pagosa Springs and much of Archuleta County sit on one of the largest geothermal aquifers in Colorado. Currently, the only use of this resource has been springs for the tourists to soak in and for heating a few buildings downtown. But we can do so much more! Our geothermal potential has been studied for many years. A 1980 study suggested that there is 200 degree water at two thousand feet down, but at that time geothermal power generation technology required 300+ degree water. Four pilot projects will be supported, expected to facilitate US$ 420million of private-sector investment and the installation of 140 MW of geothermal capacity. Munich. With the new advisory services agreement Munich Re will be supported by the International Finance Corporation (IFC) in identifying and preparing suitable geothermal projects in Turkey that will use exploration risk insurance to reduce their exposure to the geothermal-well productivity risk. Government has allocated $27 million (Rwf17.1bn) towards the drilling of three geothermal wells on the southern slopes of the Karisimbi volcano, an official from Energy, Water and Sanitation Authority (EWSA) has said. A bill that would have given Hawaii County the authority to authorize permits for geothermal projects on the Big Island appears dead in the current legislative session. Mar 27, 2013 -Sumitomo Corporation (head office:Chuo-ku)(head office:Tokyo)(president and ceo:Kuniharu Nakamura)(president and ceo:hereinafter "Sumitomo") announces that it has entered into a contract with Energy Development Corporation (hereinafter, "EDC"), the largest geothermal power generation company in the Philippines, for the relocation of the existing unit and equipment of the Northern Negros Geothermal Power Plant (hereinafter "NNGPP") to the site of the Nasulo Power Project (hereinafter "Nasulo"), in December 2012, and that it has recently commenced activities in relation to this project. The 32nd Annual Award winners will be announced at the GRC Annual Meeting in Las Vegas, Nevada. On March 13-14, 2013, a wide range of stakeholders gathered in Dar-es-Salaam for a Tanzania Government-hosted workshop to consider the country's "Geothermal Legal and Regulatory Framework". Participants included government officials, private developers, geothermal resource survey specialists, development partners, lawyers and civil society representatives. MENA Geothermal Jordan, a leading company in the field of designing geothermal heating and cooling systems, signed an agreement to install a geothermal system for three luxurious villas in Al Humar area in Fuheis, Jordan. The agreement was signed by company representative in Jordan and the three villa owners, in the company office in Amman. Bridgetown, Barbados -- Dominica is among the first to benefit from a US $ 52 million Caribbean Investment Facility (CIF), which was launched by the European Union in Bridgetown, Barbados on Friday, March 22, 2013. A bill intended to increase county authority over geothermal development was killed in a joint committee hearing yesterday. “It’s very disappointing” former Hawaii County mayor Harry Kim said today, describing his frustration over the bill’s failure. Bids for development of a geothermal well that will provide lower-cost heat to the Lake Hospital District and Lakeview schools were opened and accepted during a pair of meetings in Lakeview Thursday. The Geothermal Resources Council (GRC) will hold a two‐day geothermal workshop in Sacramento, California, on June 10‐11, 2013. Titled “Resource Assessment and Optimization”, the workshop will provide practical information to anyone interested in geothermal energy, including developers, financiers, utilities, regulators, pubic‐interest organizations, and members of the academic community. This GRC workshop will describe how to assess the suitability of geothermal resources for development and expansion once initial exploration has been completed. Presentations will focus on insights to be gleaned from well testing, reservoir simulation, geochemistry, and ongoing resource monitoring. Experienced practitioners in these areas will discuss techniques, and several geothermal operators will present case studies illustrating how the techniques have been applied to their projects. Speakers at the workshop will include Jim Lovekin, Minh Pham, Chris Klein, and Ethan Chabora, all of GeothermEx Inc. a Schlumberger Company, Paul Spielman of Ormat, and Magalay Flores and Helio Rodriguez of Comisión Federal de Electricidad (CFE) of Mexico. More information on the geothermal workshop can be found on the GRC website at: www.geothermal.org. Registration is now open. Seating is limited. After the short course on June 12 an optional field trip will visit The Geysers Geothermal Field including Calpine’s Geothermal Visitor’s Center, power plants and viewing some surface geothermal manifestations. The Indonesian energy and mineral resources ministry said a potential geothermal reserve has been found in the district of Kolaka, Southeast Sulawesi Province. The geothermal reserve was found near nickel mines in Kolaka by the ministry`s researchers, Made Suantika, the head of soil shifting and mitigation division at the ministry, said here. The surveys by the ministry showed that in addition to nickel and non metal minerals, there were renewable energy resources, Made said. "The reserve could be developed to generate electricity such as in geothermal power plants in West Java," he said. GRC member and Nevada State Geologist James E. Faulds presents a thought-provoking question as the topic of the Nevada State Museum’s Frances Humphrey Lecture Series at 6:30 p.m. Thursday, March 28. In “Why is Nevada in Hot Water: Tectonic Controls on Geothermal Activity in the Great Basin,” Faulds focuses on how fault systems initiate and evolve through time. Geothermal studies enhance understanding of what controls hot fluids in the earth’s crust and aid in exploration and discovery of energy resources. Scientists study geologic faults and stress conditions to determine where to drill. The museum is at 600 N. Carson St., Carson City, Nevada. Doors open at 6 p.m. The program is free for museum members and for youth age 17 and under. Regular adult admission is $8 and includes the lecture. For more information, contact Deborah Stevenson: dstevenson@nevadaculture.org or 775/687-4810, ext. 237. 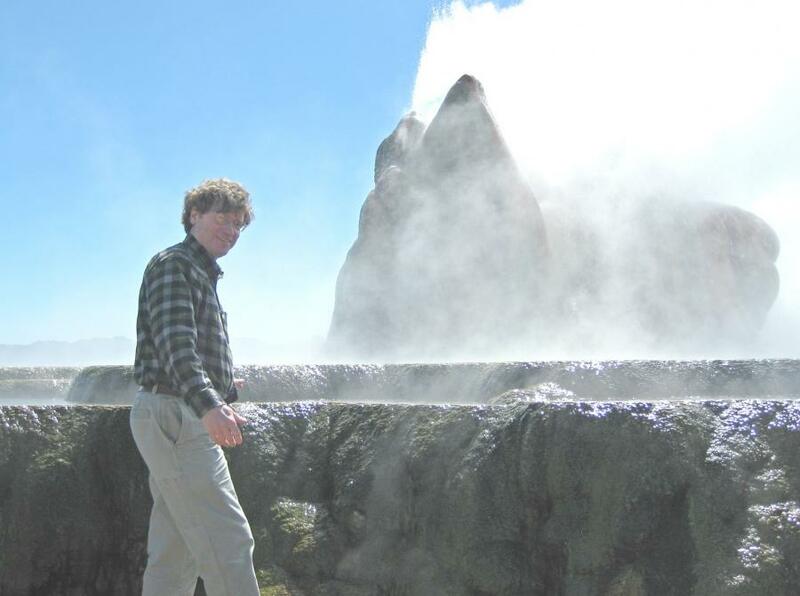 Today’s guest is Karl Gawell, Executive Director of the U.S. Geothermal Energy Association. We will discuss how geothermal energy works, how it differs from other energy sources in cost and cleanliness, and how U.S. energy policy (or the lack thereof) impacts our nation’s capacity to fully utilize geothermal energy. Currently, geothermal plants generate less than 1% of total U.S. electricity, but according to a report released in 2006 from the Department of Energy, our domestic reserves of geothermal could supply our current rate of electricity consumption for 30,000 years! What are we waiting for?? Tune in and find out the latest news in geothermal energy development. A multi-sectoral monitoring team of the Northern Negros Geothermal Project (NNGP) chaired by the Philippine environment Management Bureau and the Department of Environment and Natural Resources (DENR) conducted an inspection for the air and water quality compliance of NNGP. The inspection result showed that the Energy Development Corporation-NNGP meets the DENR Effluent Standards for Air and Water Quality. A quarry near Penryn, Cornwall in south-west England, which was the site of the first deep geothermal project has gone up for sale and already received interest from Saudi Arabian Oil companies and off shore drilling firms. Rosemanowes Quarry was known as Hot Rocks and operated between the 1970s until it closed operations in 1991. It was well known in science and engineering circles across the world as the site of the first such project, which was, at the time, a groundbreaking piece of engineering. The company looked at sourcing energy from heat in the rocks three kilometers under Cornwall and technology from the site has led to geothermal power plants being built from the USA to Asia. The 20 acre site is on the market with Miller Commercial with offers over £750,000. Peter Heather, a partner at the firm, said: "It is the perfect environment for companies involved in down-hole drilling engineering and testing of specialist tools." Apple Inc. now uses only renewable energy sources to power its data centers, the iPhone maker said in an updated report on its environmental policies. The company’s data centers now run on energy sources such as solar, wind and geothermal, instead of coal or other fossil fuels, Apple said on its website. The centers house server computers that store and distribute songs, applications and other content from services such as iTunes, iMessage and iCloud. On its website Apple says its newest data center, currently under construction in Prineville, Oregon, will be environmentally responsible. Oregon allows the direct wholesale purchase of renewable energy through Direct Access, and Apple is using this program to opt out of the default grid mix and directly access local renewable energy sources, such as wind, hydro, solar, and geothermal power — enough to power the entire facility. Another data center to be located in Reno, Nevada, will take advantage of Nevada’s excellent natural solar radiation and geothermal resources to completely meet the energy needs of the data center. A patent application Involving EGS by the inventors Bour, Daniel L. (Granite Falls, WA); Petty, Susan (Shoreline, WA), filed on September 4, 2012, was cleared for further review by the US Patent Office on March 14, 2013. The patent's assignee for patent serial number 603410 is AltaRock Energy, Inc.
"Systems and methods for maximizing energy recovery from a subterranean formation are herein disclosed. According to one embodiment, a selected subterranean open-hole interval is isolated and at least one fracture is stimulated in the isolated subterranean open-hole interval." The New South Wales government is hoping exploration for hot rocks in the state's west could result in more renewable energy. It has lodged exploration applications to drill for geothermal energy near Wilcannia, Pooncarie and Cobar. The Program Director for Coal Innovation in the Department of Trade and Investment, Rick Fowler, says there is potential for the areas to be mined for renewable energy. 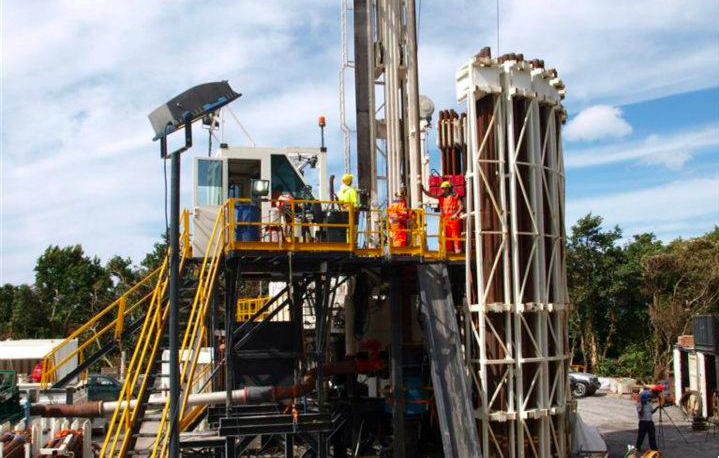 Montserrat officially begun drilling for geothermal energy on Sunday, the government announced. After resolving “a couple of last minute mechanical issues,” the drilling began in Cork Hill on the first of two production wells in Montserrat. Iceland Drilling Company is doing the drilling work, following a contract signed last year. The project management, engineering and site supervision contract went to Capuano Engineering Co. of Santa Rosa, California who are on location monitoring and controlling the project development with EGS, Inc. as subcontractor to monitor the geologic progress and log the well as it is drilled. Opening today in Calgary, Alberta, Canada, the 2013 the Canadian Geothermal Energy Association (CanGEA) conference offers the chance to learn more about recent project developments, Canadian and global database and mapping initiatives, and current research in the high temperature geothermal energy sector. The conference will host workshops, presentations, panel discussions and a welcome night reception. The speaker list includes some of the very best in the geothermal industry. Legislation seeking to change regulations regarding geothermal development in Hawaii remains alive though it’s not quite the same bill with which lawmakers started. House Bill 106 initially sought to repeal Act 97, legislation adopted last year that eliminated geothermal subzones, a land use designation first created when the state began pursuing geothermal development but since seen as too burdensome by state land managers. Critics of the act, who believe geothermal development should be restricted to designated areas, say it removed too many regulations for tapping into the state’s underground heat sources, including a county permitting process. The House Committee on Water and Land replaced HB 106 last month with another geothermal bill. The new version also would re-establish the geothermal resource permit process for counties but would not reinstate the subzones. It also would require a “buffer zone” between new geothermal development and other lands, and assessments for new projects that include environmental and social impacts, and the development’s compatibility with nearby land uses. Ormat Technologies, Inc. announced today that in April 2013 it will begin selling up to 14 MWe of geothermal power from the G3 plant in the Mammoth Complex in California to Pacific Gas & Electric (PG&E) under a new 20 year Power Purchase Agreement (PPA). Deliveries under a separate PPA for up to 7.5 MWe of geothermal power from the G1 plant in the Mammoth complex are expected to start by the end of 2013. Management anticipates that the switch to the new 20-year PPA's with improved rates that are secured until 2033 will significantly improve the company's profitability from this complex as they will replace the variable rates under the current Standard Offer #4 PPAs, which are based on the Short Run Avoided Cost (SRAC) energy rate that is tied to natural gas prices. The U.S. State Department has announced a new $6 billion initiative to promote and finance the development of 12 GWe of geothermal resources in Indonesia. The monies will come from leveraging existing financing authorities at Ex-Im, OPIC, USTDA, and State. The goal is to export U.S. goods and services to Jakarta, develop resources in Sumatra, and transmit the renewable power to Singapore. The Singapore government is interested in drastically reducing its coal fleet and to promote itself as a "eco-friendly" city-state. The underlying policy rationale surrounds overcoming the difficult FDI climate in Indonesia, which the U.S. is hoping to overcome through this initiative. This will also align with the Administration's diplomatic Asia "pivot" efforts. Currently, State is looking to garner private sector interest for this initiative, and is seeking companies for a potential Southeast Asia due diligence mission. There will be a major announcement – likely by Secretary Kerry – this September at the ASEAN Summit in Brunei. Every week, about 17 tanker trucks travel 500 kilometers from Mendoza, Argentina to the Veladero mine to deliver diesel fuel used to generate electricity at the site. The trucks transport about 30 million liters of fuel annually, and Veladero’s diesel generators produce an average of 12.5 MWe. But Veladero could soon derive the bulk of its power from a different source: geothermal energy. Barrick Gold Corp. recently agreed to invest up to $12 million to explore the power-generating capacity of a geothermal reservoir located about 10 kilometers from Veladero in Argentina’s San Juan province. “What makes this very attractive is it’s 100 percent renewable energy and it’s available 24-hours a day, which is ideal for a mining company because we operate around the clock,” says Scott Fraser, Barrick’s Director of Power Projects. Kenya Electricity Generating Company (KenGen) plans to quantify the value of geothermal gases in its fields and use the assets to issue a bond to fund expansion. Outgoing managing director Eddy Njoroge said the idea is to value its steam assets to guarantee capital for long term investments. "We are looking to do asset backed security and we just appointed advisors to look at what value there is that can be securitised," said Njoroge. "We are not sure how much but it could between Sh20 billion and Sh30 billion." He said the money raised from the bond issue will be used to fund projects to generate an additional 1,500 MWe between now and 2018. He was speaking on the sidelines of an extraordinary general meeting of the bond holders of the cash call issued in 2009. One of the first policy victims of Japan's incoming Liberal Democratic Party is likely to be the commitment to phasing out nuclear power. The promise made after Fukushima does not sit well with the pro-business party. As the country nears the two-year anniversary of the second-worst nuclear accident in history, the protests continue every Friday night outside the official residence of the prime minister of Japan. The demonstrations are very Japanese in their nature; more colorful than confrontational and polite instead of provocative. But it seems likely that these people, drawn from all walks of life in this post-nuclear disaster nation, are to be disappointed in their campaign to have the government adhere to its predecessor's promise to do away with Japan's reliance on nuclear energy by the latter half of the 2030s. The Bureau of Land Management (BLM) oversees geothermal energy development on public lands with a patchwork of regulations and no standardized inspection and enforcement program, the Interior Department's internal watchdog said Monday. The report by department Deputy Inspector General Mary Kendall (PDF) comes as the department presses to increase clean energy output from federal lands beyond the 2015 target of 10,000 MWe set in the 2005 energy law passed by Congress. The department updated its geothermal regulations in 2007, but old operational orders remain on the books, Kendall said. She said the result is a "web of requirements" rather than a clear order, and order language covering induced earthquake hazards that is not reflected in the regulations. Kendall's report did not report safety problems resulting from the lack of a standard inspection and enforcement system, but said that it has led to inconsistent oversight by BLM field offices and difficulties in information sharing. Those inconsistencies have led to "different enforcement expectations for industry depending on where their operations are located," Kendall said. BLM agreed to review and update its orders and inspection criteria. It also agreed to review its inspection staffing levels and draw up new guidance on seismicity hazards. An alloy that may improve high-temperature electronics in oil and geothermal wells was really a solution in search of a problem. Sandia National Laboratories first investigated the gold-silver-germanium alloy about 15 years ago as a possible bonding material in a new neutron tube product. But a design change forced Sandia to shelve the material, said Paul Vianco, who has worked in soldering and brazing technology at Sandia for 26 years. 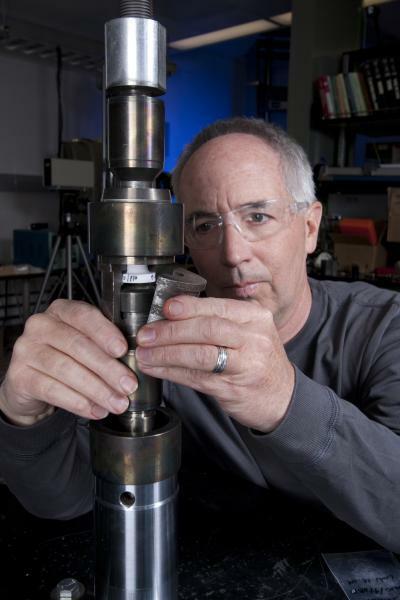 Then a few years ago, researchers working on other projects with applications inside a well, referred to as downhole, asked Sandia's geothermal group to develop electronics to monitor well conditions in field operations. Circuit boards placed downhole in oil and geothermal wells must withstand high temperatures and pressures, excessive vibrations and other extreme environments. The gold-silver-germanium alloy is suitable for those conditions, Vianco said. The Geothermal Resources Council (GRC) presented a two‐day course at the 2nd ITB Workshop in Bandung, West Java, Indonesia, on March 4‐5, 2013. The course, Exploration Drilling and Early Stage Geothermal Characterization was taught by GRC members and leading lights of the geothermal industry: Lou Capuano, Jr., Paul Brophy, Paul von Hirtz, Subir Sanyal and Steve Ponder. 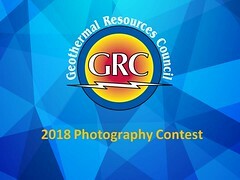 The GRC Photo Contest Is Back! The VolcanElectric Mask is an Honorable Mention in the eVolo 2013 Skyscraper Competition. Volcanoes pose a threat to populations living in their vicinity, yet also have the potential to provide huge amounts of geothermal energy. 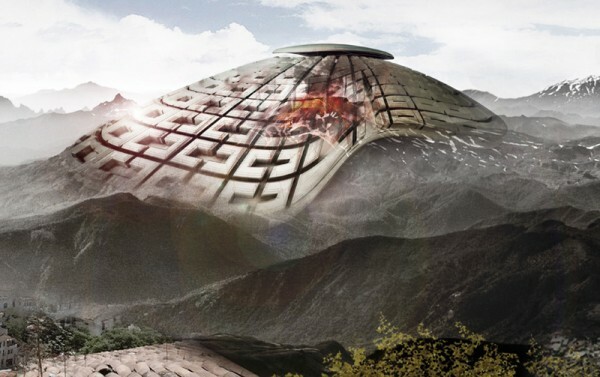 A new design, known as the VolcanElectric Mask aims to deal with both of these issues; during periods of relative inactivity the technology harnesses the geothermal power of the volcano to generate clean electricity, and during eruptions it works to minimize damage and destruction. The VolcanElectric Mask takes the form a giant dome which covers the volcano. Hanging down from inside of the dome are screw-like tentacles which are drilled into the earth covering the volcano to monitor temperatures, help to predict eruptions, absorb CO2 and convert it into dry ice, and produce electricity by using the natural heat of the lava below to turn trapped rainwater into steam which can then drive a turbine. Enel Green Power has broken ground for the construction of the Bagnore 4 geothermal power plant, located in the municipalities of Santa Fiora and Arcidosso, in the province of Grosseto (Tuscany). The project calls for the construction of two 20 MWe turbines, for a total installed capacity of 40 MWe. Once completed, the plant will be able to generate up to 310 million kWh of electricity per year, thereby saving 70,000 TOE (tonnes of oil equivalent). The new plant, designed to perfectly fit into the surrounding environment, will join the 20 MWe Bagnore 3 plant. The construction of Bagnore 4 will require a total investment of, approximately, 120 million euros. 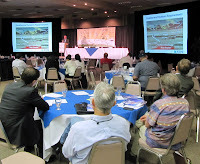 A Geothermal 101 + Exploration workshop was the climax to the Imperial Valley Renewable Energy Summit & Expo in southern California. The meeting was held at the Barbara Worth Resort and Country Club in Holtville, California. The Geothermal 101 + Exploration workshop was hosted by GRC member Gene Suemnicht, CEO/Principal, EGS Inc.
Gene explained the process of exploration for geothermal resources and how this clean, dependable, renewable energy is important to the Imperial Valley region. California utilities spent more than $2.53 billion in 2011 buying electricity from solar, wind and geothermal plants to satisfy the state's ambitious renewable power goals, according to a report issued Thursday. That figure represented a 16 percent increase from 2010, when California's three big investor-owned utilities spent $2.18 billion. In three reports sent to the Legislature Thursday, the California Public Utilities Commission tries to add up some of the costs triggered by the renewable standard as well as gauge the utilities' progress toward meeting the 33 percent goal. The reports do not estimate the impact on customers' monthly bills. Renewable prices are falling as more new solar, wind and geothermal facilities open. But the utilities have still warned that the push to buy renewable power will raise customers' bills. PG&E, for example, estimates that renewable contracts will add about 1 to 2 percent to bills each year through 2020. The recent Iceland Geothermal Conference, which took place between 5th and 8th March 2013 in Reykjavík, has helped carry a positive message for the possibilities within the green energy industry, according to various reviews posted online. Roughly 600 participants, delegates, and exhibitors attended the conference to discuss changes and forward thinking within the energy industry, with 55 presentations given by global figureheads within the industry. Puna Geothermal Venture was back to normal operations Wednesday night after it was shut down that afternoon, causing a plume of steam to be released into the air. The 38 MWe power plant shutdown shortly before 4 p.m. when a transmission line between Kaumana and Pohoiki was tripped, said Curt Beck, energy services department manager with the Hawaii Electric Light Co. The fault, which could have been caused by a tree branch, disconnected the line from the rest of the grid, leaving PGV with nowhere for its electricity to go. The plant in Pohoiki automatically shutdown in response. With the plant offline, steam produced from the geothermal process was released as a safety measure. About 20,000 customers lost power for about 15 minutes, Beck said. HELCO turned on its backup diesel generators to make up for the temporary loss of PGV. How to integrate the large number of renewable energy sources in California that have sprung up in recent years was just one issue that was discussed Thursday during the first full day of the sixth annual Imperial Valley Renewable Energy Summit & Expo at the Barbara Worth Resort in Southern California. Jonathan Weisgall, vice president of legislative and regulatory affairs for MidAmerian Energy Holdings Co., opened a panel discussion about new realities facing the renewable energy industry with a brief overview of some of those challenges. “California, we’re the victim of success. A huge amount of renewable energy has come online in the last six years,” he said. The renewable energy summit concludes today, following discussions about the Salton Sea and a workshop on geothermal exploration. A Geothermal 101 + Exploration workshop is to be held today at the Imperial Valley Renewable Energy Summit & Expo in southern California. The meeting is being held at the Barbara Worth Resort and Country Club in Holtville, Ca. The Geothermal 101 + Exploration workshop will be hosted by Gene Suemnicht, CEO/Principal, EGS, Inc. at 12:30 today, Friday, March 15. Geothermal development has been an important part of the energy economics of the Imperial Valley for several decades. Domestic and international geothermal exploration has increased in recent years with revived interest in renewable energy. The Geothermal 101 workshop will review the geologic settings of different geothermal resources with an emphasis on the high enthalpy geothermal resources of the Imperial Valley. The workshop will cover the common elements of conventional geothermal systems and the processes involved in exploring for and developing a geothermal field. Geothermal energy remains a strong competitor in utility-scale renewable projects because geothermal generation is base-load power that offers a great advantage to utility companies in displacing similar constant load fossil fuel generation. The workshop will cover some of the differing perspectives on renewable energy projects and the distinct advantages, but profoundly different risks involved in renewable generation technologies. Open and interactive workshop sessions will leave ample time for questions and comments. The Tanzanian government intends to diversify the power generation mix in the national grid system by increasing the proportion of natural renewable energy sources. Deputy Minister for Energy and Mineral Resources, Mr Stephen Masele revealed the information in Dar es Salaam, while opening a workshop on Geothermal Legal and Regulatory Framework. Being one of the East African countries passed by Rift Valley system where geothermal sites are found, Tanzania has a geothermal potential of more than 650 MWe, most of the prospects being located within the East African Rift Valley System. Environmental groups have rallied behind a new effort by congressional Democrats to put a tax on carbon dioxide emissions in an effort to reduce the budget deficit and tackle climate change. On Tuesday, Democrats in the House and Senate released draft legislation to establish a price on carbon emissions that would gradually increase over time to reduce the use of carbon-heavy energy sources, like coal. GRC member Jefferson W. Tester is a professor of sustainable energy systems, director of the Cornell Energy Institute, associate director of Cornell University’s Atkinson Center for a Sustainable Future and one of the world’s leading experts on geothermal energy development. Tester calls a bill to promote U.S. geothermal energy development, now before the Senate’s Committee on Energy and Natural Resources, a strong step toward job growth and energy security. Developers of renewable electricity projects in the UK will be able to apply for support to enable them to commission and build projects more quickly. The British Government’s Final Investment Decision Enabling program is designed to help developers of low carbon electricity projects make final investment decisions ahead of changes to the electricity market in the second half of 2014. Further details of the process for providing support to renewable electricity projects have now been published, including information on the form of support available and the qualification criteria. 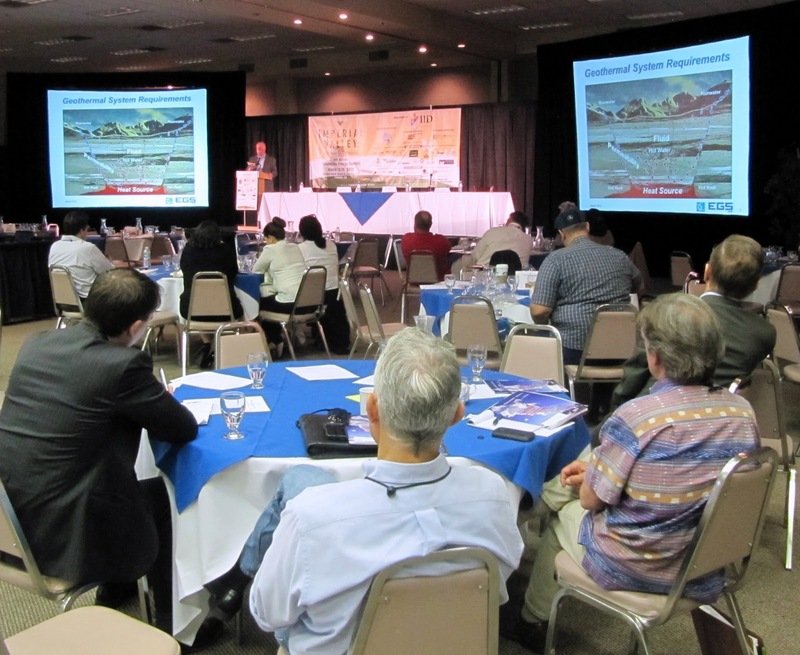 The sixth annual Imperial Valley Renewable Energy Summit & Expo started today promising to be a watershed for renewable energy developers and their projects. The summit kicked off with a golf tournament and a tour of renewable energy projects in Imperial County and a networking reception at the opening of the expo. A geothermal workshop, mixers and panels of industry experts are scheduled for Thursday and Friday. The Geothermal Resources Council (GRC) is representing the geothermal community at this important event. Resources at CalEnergy Operating Corp.
As part of the Imperial Valley Renewable Energy Summit & Expo being held this week, attendees were given the opportunity to tour the various renewable energy facilities in the county. 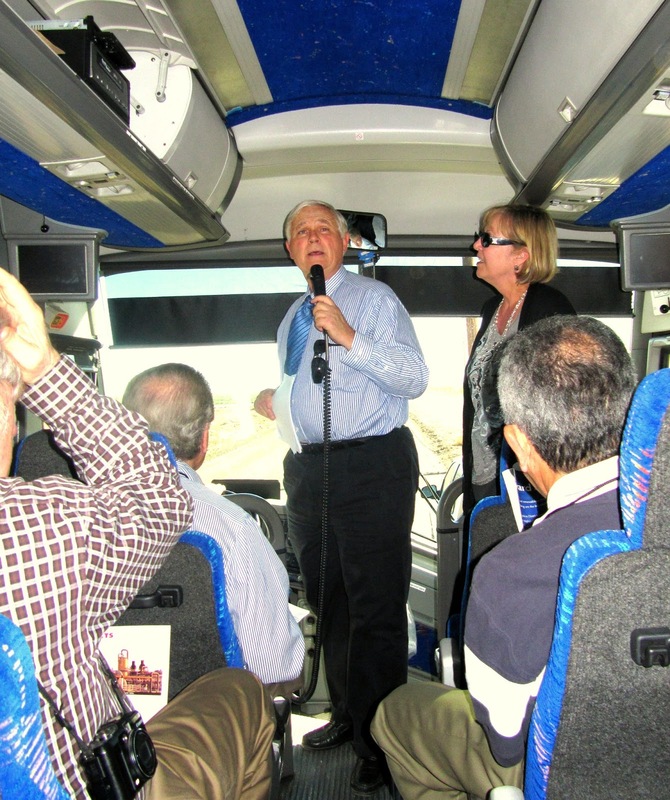 Setting out from the Barbara Worth Country Club near Holtville, Imperial County, the bus tour highlighted the wind, solar, biofuel and geothermal power plants that energize this agricultural powerhouse in the middle of the Southern California desert. The geothermal highlights of the tour were: Ormat - Heber 1, Heber 2 and Heber South Geothermal Plants, Energy Source Geothermal / John L. Featherstone Geothermal Plant / Simbol Materials, Various CalEnergy Geothermal Plants, and Ormat North Brawley Geothermal Plant. The highlight of the trip was a presentation by Alexander Schriener Jr., Director, Geothermal Resources at CalEnergy Operating Corp. He gave a very informative and entertaining talk about the unique nature of the Salton Sea geothermal resource and Calenergy's geothermal power plants in the area. 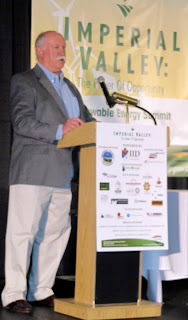 The sixth annual Imperial Valley Renewable Energy Summit & Expo starts today, and as previewed in a press conference Tuesday at the Barbara Worth Resort, the summit promises to be once again a watershed for renewable energy developers and their projects. The summit kicks off with a golf tournament and a tour of renewable energy projects in Imperial County. Workshops, mixers and panels of industry experts are scheduled for Thursday and Friday. About 400 people are expected to attend the summit, said Tim Kelley, president and chief executive officer of the Imperial Valley Economic Development Corp.
Additionally, the summit will feature an exposition area for vendors and developers. The Geothermal Resources Council (GRC) will be exhibiting and reporting from the summit. Bottle Rock Power, LLC, will have to wait a little longer to find out if it can carry on geothermal activities for the next 30 years after a Cobb nonprofit group appealed the Lake County Planning Commission's approval of the extension. Friends of Cobb Mountain filed an appeal to the Lake County Board of Supervisors (BOS) Thursday, arguing in part that the commission didn't follow state environmental law with its endorsement late last month. "Our goal is not to hinder or stop or create an issue. We just believe that this extension of a 30-year use permit requires some level of review, not just a blanket approval," Robert Stark, secretary-treasurer for the organization, said Monday. County planning commissioners voted to extend Bottle Rock Power's use permit until 2043 after a contentious hearing Feb. 28 during which 10 Cobb residents spoke out against the proposal. Friends of Cobb Mountain listed two reasons for its appeal of that decision, claiming first that the commission failed to meet California Environmental Quality Act (CEQA) requirements. The group did not elaborate on what violations it thought took place. The Advanced Geothermal Systems panel at the University of Texas Energy Forum reviewed both current and promising new advanced geothermal systems, much of which receives DOE support. "I am in full support of R&D that provides electrical power at lower risks and lower costs," said Douglas Hollet, director of geothermal technologies in Washington, D.C., who attended the forum. Douglas Blankenship, manager of the geothermal research department at Sandia National Laboratories, who gave an overview of current status of Enhanced Geothermal Systems (EGS). He outlined both its tremendous long-term potential due to the vastness of the hot dry rock resource and its challenges in creating artificial reservoirs. Brian Anderson, associate professor at West Virginia University, added that it is difficult to attain closed circulation between injection wells and production wells, which results in the loss of working fluid and can lead to beneficial sequestration of the CO2 into the earth when using CO2 as the working fluid. Both Doug and Brian concluded that EGS technology will not be commercially viable for several years, but its long-term potential is very promising. The Los Angeles Department of Water and Power (DWP) is set to start buying electricity from a new geothermal power plant in northern Nevada, DWP announced today on Twitter. Unless the Los Angeles City Council decides to intervene in the next few days, 13.71 MWe of power from the Wild Rose Geothermal Facility near Gabbs, NV will start flowing toward L.A.'s grid in January 2014. The 20-year Power Purchase Agreement, which is part of a deal that also involves Burbank's municipal electrical utility, will set DWP back $99 per megawatt-hour, for an anticipated cost of $11 million a year. The 35 MWe Wild Rose facility, owned by the geothermal firm Ormat, is now under construction in Mineral County, Nevada west of Gabbs. Approved by the BLM only a few months ago, the plant is expected to begin generating power late this year. The Board of Directors of Panax Geothermal Limited today announced the resignation of Kerry Parker as Managing Director and Chief Executive Officer. Kerry Parker will leave the full time employment of Panax with effect from 30 April 2013. To ensure a smooth transition for Panax, Mr Parker will remain on the board of Panax as a Non-Executive Director until 30 August 2013. Commenting today, Panax Chairman Athan Lekkas sincerely thanked Kerry for his contribution to Panax and to the geothermal sector both in Australia and internationally. The Board expressed its appreciation for Kerry's contribution in shaping and advancing Panax's position as an Australasian geothermal exploration and development company. Kerry Parker commenced with Panax in 2007, and has been instrumental in assembling and managing Panax's portfolio of advanced geothermal development opportunities in Indonesia. Policies inducing geothermal energy development are being asked for by the Imperial County Board of Supervisors, as the county approved a resolution recognizing the importance of geothermal energy Tuesday. Over the last five years the county has seen renewable energy generation activities increase exponentially, particularly in the solar industry, a report to the board notes. However, the report also notes that throughout the same time only two geothermal plants have been built. This comes as Imperial County holds the largest geothermal resource in California, a state that already contains the largest amount of geothermal generating capacity in the United States. And yet, “There (have) been some concerns raised by the fact that we have not seen a lot of new geothermal projects,” said Andy Horne, county deputy chief executive officer, while presenting the resolution crafted by the county in consultation of geothermal industry representatives. Once again the race is on to get new renewable energy projects under construction by year end. While the American Taxpayer Relief Act of 2012 ("ATRA") (PDF) provided the long sought extension of the Production Tax Credit ("PTC") and Investment Tax Credit ("ITC") for certain renewable resources through 2013 (wind, biomass, geothermal, landfill gas, trash, hydropower and marine and hydrokinetic facilities), the extension comes with terms that present new challenges for developers. Significantly, to qualify for the PTC or ITC, new renewable projects must “begin construction” prior to January 1, 2014. Under prior law, to qualify for the PTC, the facility had to be “placed in service” by the applicable deadline, which essentially required the commencement of commercial operation. The change in terminology under ATRA increases the availability of the PTC/ITC to a broader array of long lead-time projects, provided they can meet the new “begin construction” deadline by the end of this year. For projects that meet this deadline, the PTC/ITC is effectively extended by more than one year. With a gloriously cheap 100 per cent renewable energy system and a finance sector that is steadily rising out of the ashes, it is on track to create the kind of sustainable economy that many European countries can only dream of achieving. Iceland offers homes and businesses electricity at half the price of that we pay in the UK through district heating systems powered by geothermal and hydropower. It is an approach that slashes carbon emissions, virtually eliminates fuel poverty, and helps attract investment from energy-intensive industries seeking stable power prices. The Andes region of Latin America is planning to tap into the thousands of megawatts of clean energy available to them from geothermal sources, according to the International Renewable Energy Agency (IRENA). Latin America has some of the world’s largest potential for geothermal energy, estimated at 35,500 megawatts. The Andean mountain countries including Bolivia, Chile, Colombia, Ecuador, and Peru account for a significant portion of this potential. However, IRENA noted that geothermal energy in these countries remains underutilized and poorly explored. IRENA is currently working with Andean governments and seeking support from other countries and organizations with geothermal expertise to boost the Andean geothermal sector. Experts from Iceland, Mexico, New Zealand and France have already shared their skills and knowledge with Andean representatives during a geothermal development workshop organized by the IRENA in Reykjavik, the Icelandic capital known for utilizing heat and power from thermal springs and geysers. With access to hundreds of geothermal water sources, Balkan countries can use the alternative power to ease their dependence on gas and electricity, save money and cut fossil fuel usage, researchers said. 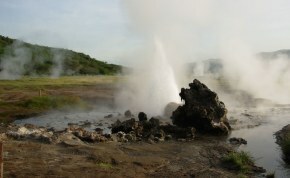 Geothermal water is ground water heated by the earth's energy. 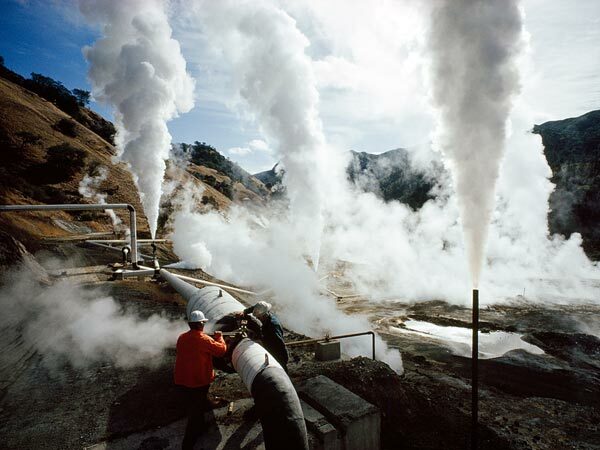 By harnessing the physical properties of steam and heat, geothermal water can be used to generate electricity. The main function of geothermal systems is to extract the water from wells, transport it and distribute it to consumers.